MK calls to dissolve Civil Administration for Judea and Samaria to bring Jewish towns under civilian control. MK Bezalel Smotrich (Jewish Home) revealed on Thursday that he had submitted a bill calling for the dissolution of the Civil Administration in Judea and Samaria. "The civil life of hundreds of thousands of residents in Judea and Samaria is managed by the Civil Administration, a hybrid body that is half military and half civilian," Smotrich said. "The Civil Administration has very good people, but the DNA of this system took what was wrong with both the military system and the civilian system." 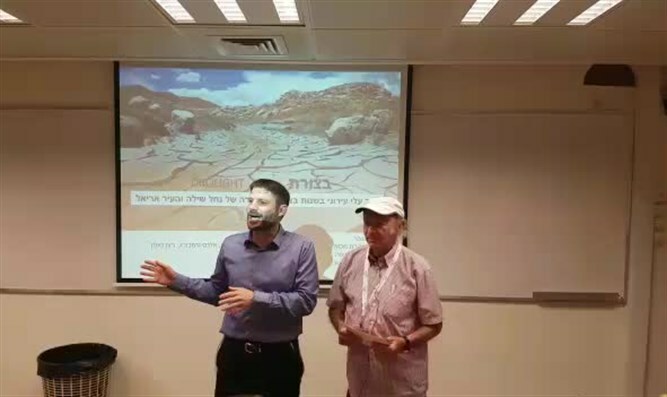 Smotrich spoke during the academic session of the "Adam and Earth Center", the research institute of the Regavim organization during a conference in Judea and Samaria held Thursday at Ariel University. He stated that the government originally decided that the Civil Administration would be responsible for the Arab residents of Judea and Samaria, while the Jewish residents would be under the jurisdiction and care of the Israeli government. "The Civil Administration has no normal website, no access to the public," Smotrich said. "A lot of the mistakes that led to the enactment of the regulation law were caused by a lack of modern computing and mapping tools. There is very little organizational memory in the Civil Administration system because many of them are military personnel who change positions every two years. If I want to buy an apartment in Tel Aviv, within three minutes a document will arrive in my email. In order to sell or buy a house in Judea and Samaria, I have to enter a military base and go through an archaic system with a clerk who still works with binders and then wait for weeks to receive any documents." "The bill sets a target date for the dismantling of the Civil Administration, and the administration's's responsibilities will be distributed to the various government ministries, as already happens today, for example, in the Education Ministry," Sumotrich concluded. "This is the right thing in terms of democracy, it is the right thing in terms of values, [and it puts us] on the path to normalization in Judea and Samaria. Also on the practical level it improves services to the citizens." Yaron Rosenthal, the director of the Kfar Etzion Field School, who also spoke at the conference, also attacked the Civil Administration. "The manager is the enforcer. It should listen and present its perspective on the important issues raised here, including a special report on the quarries that are destroying the Judean Desert. We will continue to work together with the Civil Administration to protect the environment for all of us."